Since 1969, Len Wood's Indian Territory Gallery in Laguna Beach, California has specialized in the acquisition and sale of traditional antique and contemporary Native American Indian art. The gallery features the nation's largest and most diverse selection of pre-1930 Navajo rugs and Navajo blankets and American Indian baskets as well as pueblo pottery, antique and modern Navajo and Pueblo jewelry, and more. The gallery has a back room filled with antique Navajo rugs and Navajo blankets most dating from the 1870-1930 era. The gallery also offers professional Navajo rug and Navajo blanket cleaning and Navajo rug and Navajo blanket repair services, both free appraisals and formal artifact documentation. 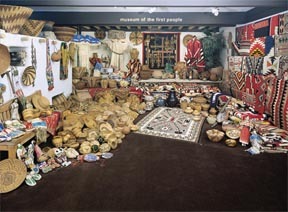 The gallery buys, sells and consigns individual items and entire collections of antique and modern American Indian art. Our entire gallery collection is now online on our huge Online Catalog. Whether you are interested in buying, selling or collecting American Indian arts or just enjoy looking at the beautiful artworks from hundreds of different tribal cultures of America from all time periods, we hope you enjoy our site. Indian Jewelry - Antique, "Old Pawn"